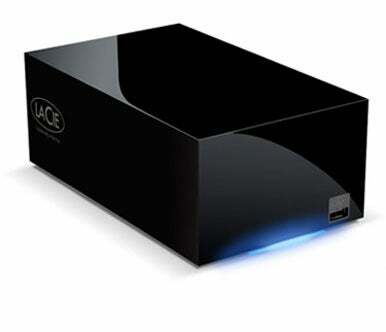 Two terabytes of storage await purchasers of LaCie’s Hard Disk Max, announced at this week’s Macworld Expo. The storage device’s two large-capacity disk drives can be set in either a RAID 0 or RAID 1 configuration with the flick of a switch. RAID 0 stripes data across both disks for the fastest data retrieval response time, while RAID 1 mirrors data exactly on both disks for maximum data reliability. The enclosure, designed by Neil Poulton, features a front USB 2.0 expansion port that can link to another external drive for data backups and a multi-purposed blue LED stripe provides ambient light and changes to red to warn of potential problems. The Hard Disk Max ships with the LaCie Setup Assistant for disk formatting and Intego Backup Assistant for Mac. (PC users get Genie Backup Assistant.) Also included is one year of unlimited online backup. The LaCie Hard Disk Max costs $270.